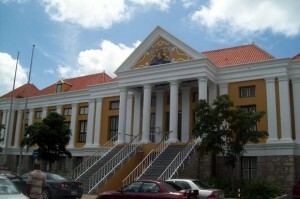 WILLEMSTAD – During the pro-forma session in the case Magnus (the murder of the political leader Helmin Wiels) in court this morning, there was heavy confrontation between the defense and the Public Prosecution (OM). Especially Olga Saleh-Kostrzewski, attorney of the absent Elvis K., spoke sharply against the OM and prosecutor Gert Rip. She accused the OM of foul play. Saleh opens her argument with the assertion that the OM is cornered. Gradually, her tone and the accusations she made against the OM become grim. Rips mood also changes. Before she took on Elvis K.’s defense on February 29, he was without a lawyer. In that position, the OM got him to talk. Before that period, Elvis K. alias Monster, appealed on his right to remain silent. In return, the prosecution offered not to demand a life sentence against him and he would also be allowed to move to the Netherlands and await his sentence there. Taking on a lawyer was a nuisance for the OM, according to Saleh. Saleh also indicates that the OM did not record K’s interrogations. “That’s nonsense,” Rip, visibly exasperated, interrupts. The judge intervenes. Saleh had to learn from the media that K. was sent to the Netherlands. She also did not know that Monster’s statements were made in exchange for a lower sentencing and detention in the Netherlands. Rip defends the conduct of the prosecution by claiming that only a few knew about it. Monster did not want anybody to know that he made statements. According to Rip, this was for safety reasons. He also denies that a deal was made. The prosecution has made ​​it clear that a life sentence was going to be their demand if he remained silent, but the OM did not give any guarantees. K.’s interrogation was recorded with audio equipment. Saleh does not believe Rip’s arguments. “I was not allowed to know, but I do not believe that.” Contact with K. was hampered because he did not have calling cards at his disposal, and he has the right to contact his lawyer. The OM also broke the connection often when they still managed to penetrate through. She knows nothing else of his condition and has not received any official reports. From the sparse contact with K., it also revealed, according to Saleh, that he definitely wanted to keep her as a lawyer and that Monster believed that a deal was indeed closed. According to Saleh, the OM violates the rules and must be declared inadmissible in this case. The other lawyers largely joined Saleh’s argument and asked for provisional release of their clients, albeit in less harsh words than Saleh. At 14.30, the case resumes and three judges will make a decision about this case.